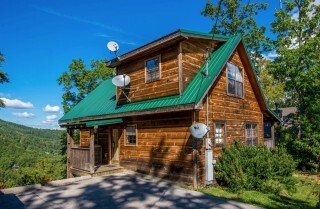 Peacefully situated among the trees, this charming 2-bedroom, 3-bathroom cabin with room for 8 is a fantastic couples' retreat or getaway for friends and family. During your days around the cabin, you'll get that much-needed relaxation you've been seeking. 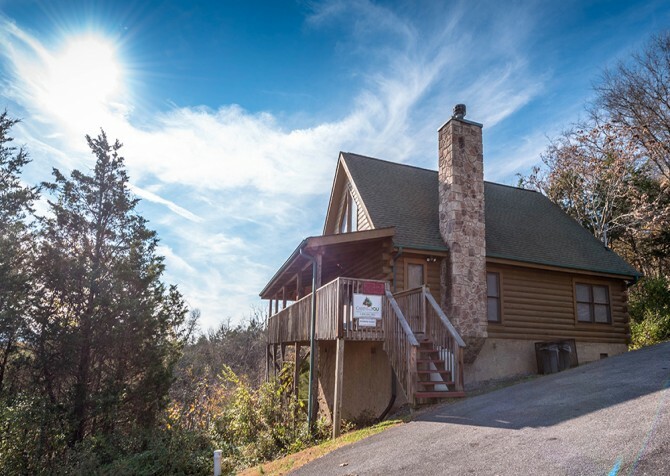 The beautifully decorated cabin features a fully equipped kitchen, beautiful mountain views, Wi-Fi, an awesome theater room, and lots of modern conveniences such as a grill, washer/dryer, fireplace, and more! 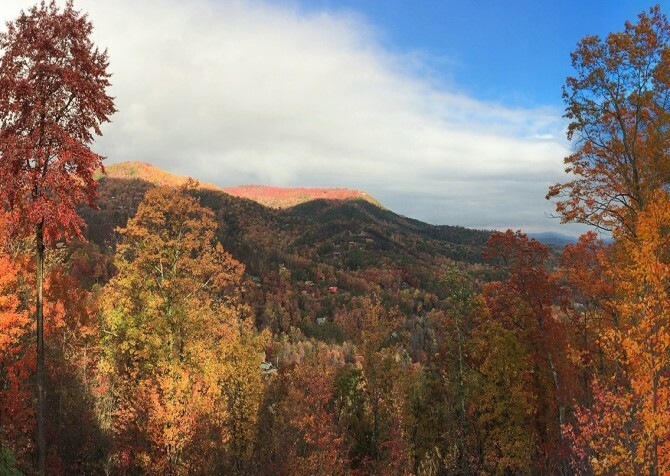 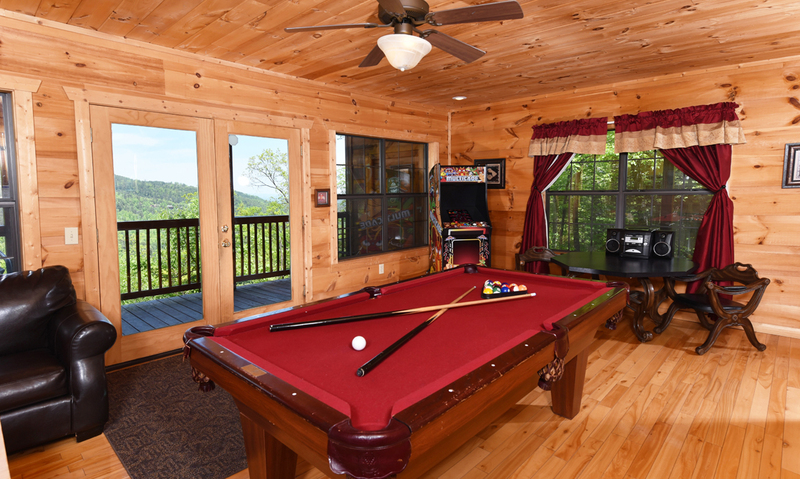 Even better, Windswept Retreat is less than 10 miles from the heart of downtown Pigeon Forge, ensuring easy access to some of the top attractions in the Smokies – Dollywood, WonderWorks, The Island, and more – along with dozens of delicious restaurants and unique shops. 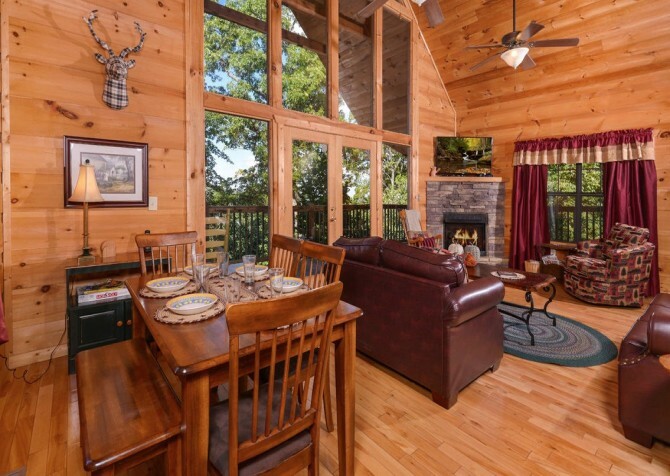 Inside this beautiful Pigeon Forge retreat, you'll find lovely décor and inviting interiors. 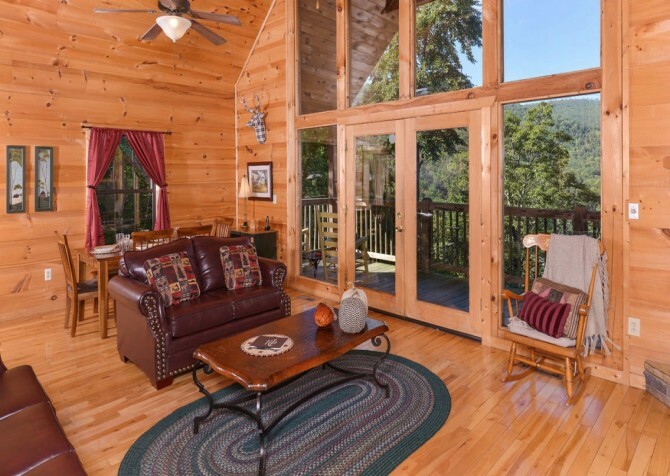 The cozy living room of Windswept Retreat features floor-to-ceiling windows that frame the beautiful wooded and mountain views. High ceilings create a spacious atmosphere, and warm wood walls keep it feeling cozy and inviting. 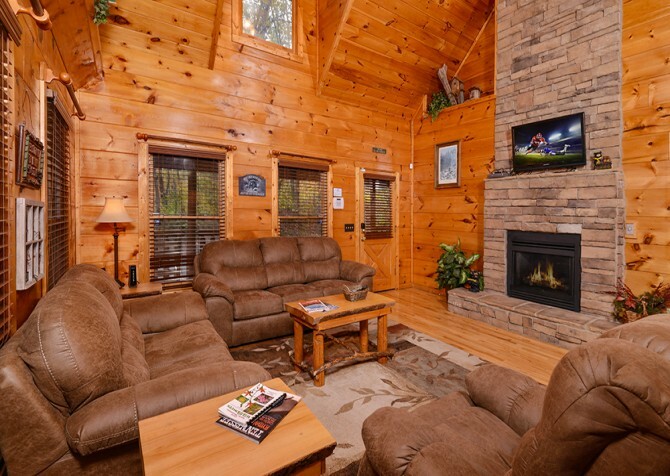 On days around the cabin, relax on the large leather sofa and matching loveseat. 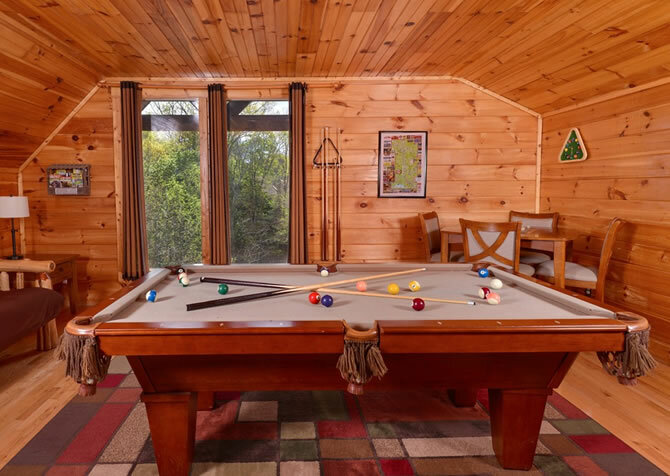 Flip on the flatscreen TV mounted above the fireplace or play some board games and card games on the coffee table in the room. With plenty of seating and room for fun, this is a great space for family and friends to hang out. On cool Smoky Mountain nights, curl up in front of the gas fireplace for a warm and relaxing night. Just imagine the memories you'll make in this lovely and homey space. 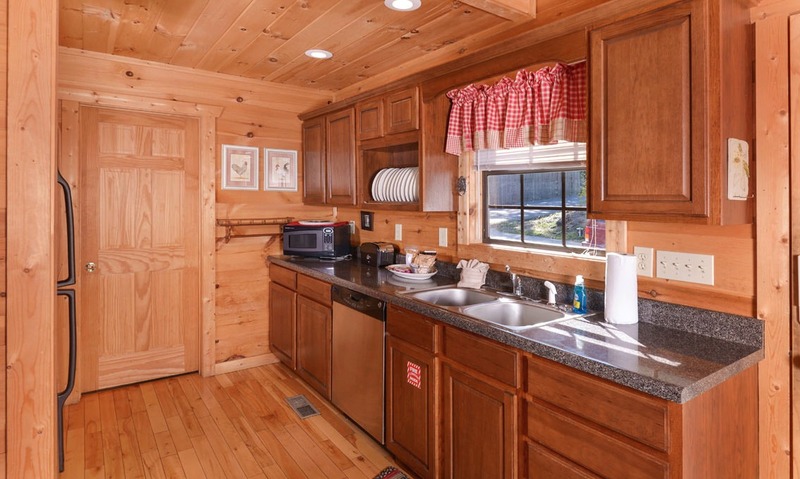 A place that will make you feel right at home, the kitchen in Windswept Retreat is loaded with all the amenities you need to make homemade meals or snacks when you're hanging out around the cabin. The open and cozy space features granite countertops, and all the appliances you need – refrigerator, stove, dishwasher, microwave, and more. It also has plenty of dishes, utensils, and glasses for snacks and romantic meals in the cabin. Make a hearty country breakfast, prepare your favorite meals during the holidays, or make some game-day snacks to enjoy while cheering on your favorite team! If you don't want to do your own cooking, you can book in-cabin meals or just use the kitchen to store leftovers from some of the great restaurants in town. 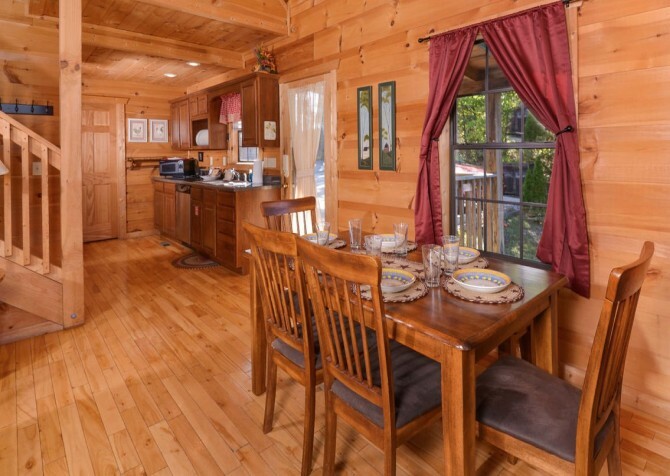 After finding all you need to make great meals in the kitchen of Windswept Retreat, head to the lovely dining area that opens up to the living room. The beautiful wood table with benches and cushioned chairs offers room for at least 6 to sit down for a family-style meal. 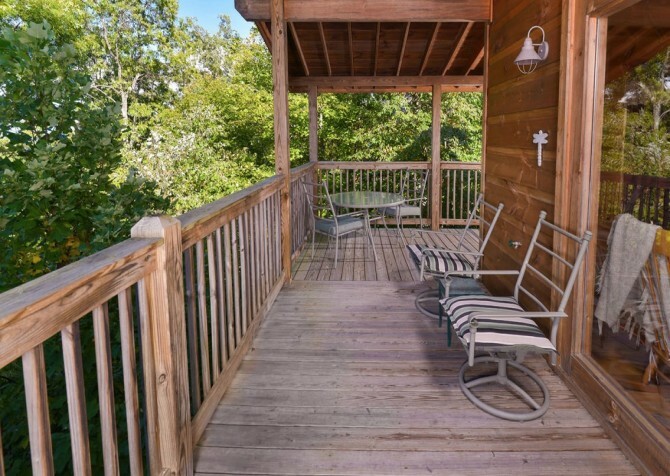 Imagine the holiday memories and family meals you'll make in this beautiful space that takes advantage of the peaceful wooded views offered here. You don't even have to leave the cabin to have tons of fun on your Pigeon Forge vacation when you stay at Windswept Retreat. Everything you need for exciting afternoons is at the cabin, including games in the elegant game room. This fun space offers something for both kids and adults, blending stylish design with functional fun. 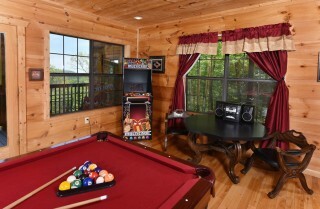 Big windows showcase the Smoky Mountain treeline, and there is plenty of seating for lots of guests to spread out and relax when not playing games. You can kick back on the leather sofa, play board games on the coffee table, try out arcade games on the multicade, listen to music on the stereo/CD player, play pool, and play cards at the large table. 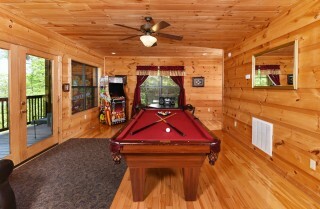 The rec room isn't the only place to stay entertained in Windswept Retreat. An impressive theater room is the place to have movie marathons, watch romantic movies, or catch a ball game. 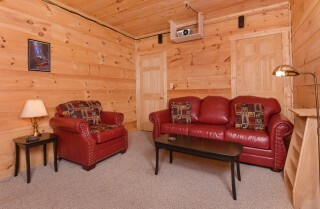 Just close the curtains and sit down on the plush leather sofa or loveseat in front of the large screen. At the end of those long days of browsing the shops along the Parkway, hiking in the Great Smoky Mountains National Park, trying the wonderful sweets in downtown, or playing at the area's most popular attractions, the bedrooms in Windswept Retreat will offer that rest you're seeking. 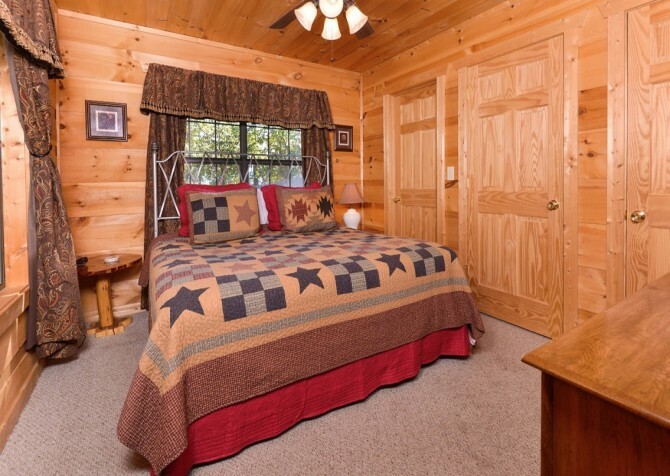 They have their own king-size beds with windows that feature wooded views. 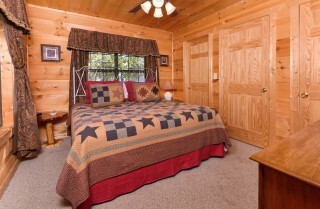 They also has the comforts of home, including TVs, reading lamps, ceiling fans, and dressers. 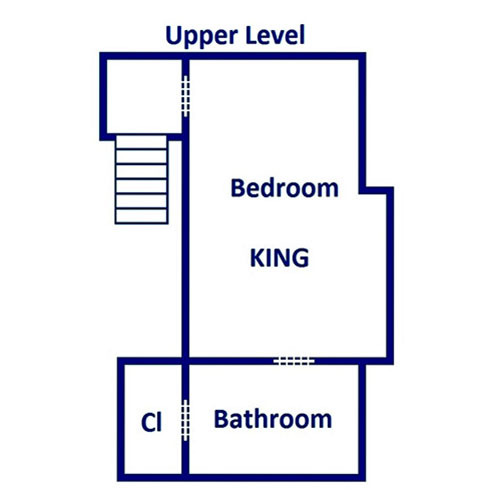 Three bathrooms also means it's easy to get ready for a night on the town - no sharing! 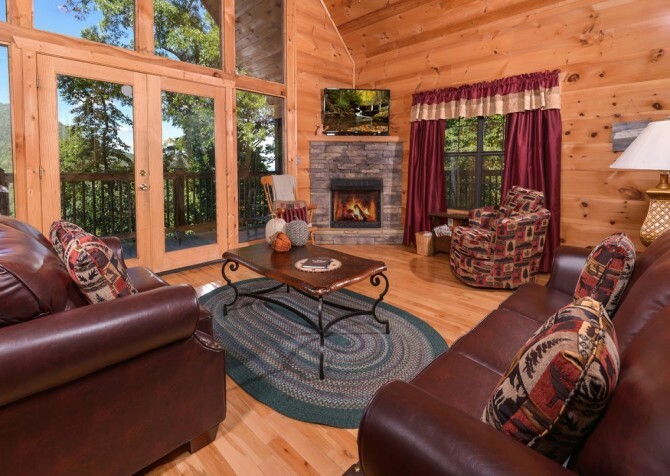 You can't come to the Smokies without spending some time in the great outdoors, and the outdoor areas at Windswept Retreat make it easy to enjoy the sights, sounds, and smells of the mountains. The cabin features 2 levels of decks, which is plenty of space to breathe in that fresh mountain air. 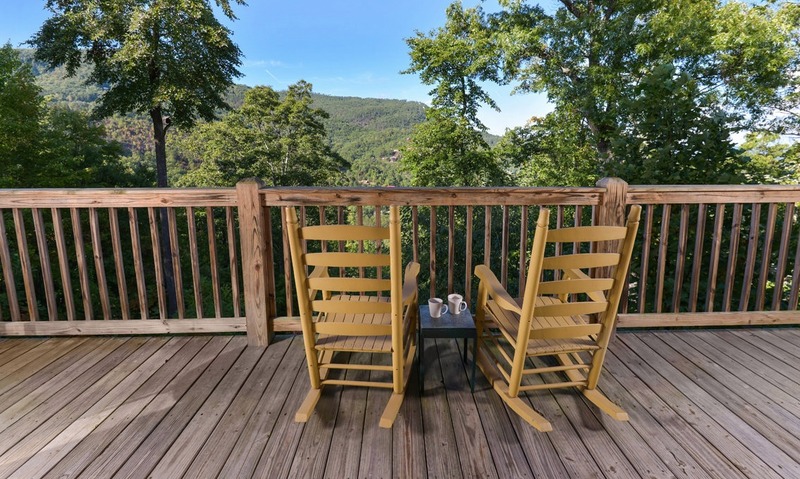 Have a drink while you sit in the rocking chairs on the wraparound porch, have a nice meal at the table, or just unwind in the padded deck chairs. And after hiking or shopping watch the stars light up the sky or watch the leaves change during fall from the deck. 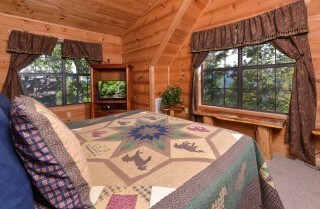 If you want to unwind inside, have a nice bath in the indoor jetted tub. 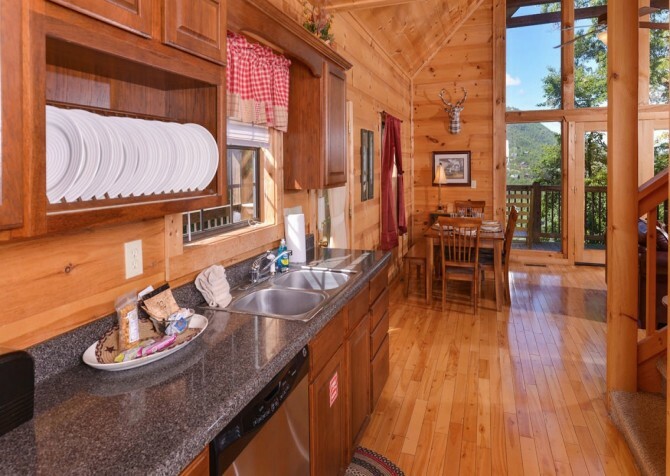 The cabin also has a washer/dryer and ironing board, so you can freshen up clothes before a nice night downtown or after a hot day in the national park. Want to see what's going on during your stay? 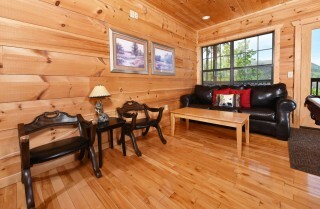 Take advantage of the Wi-Fi and check out our blog! 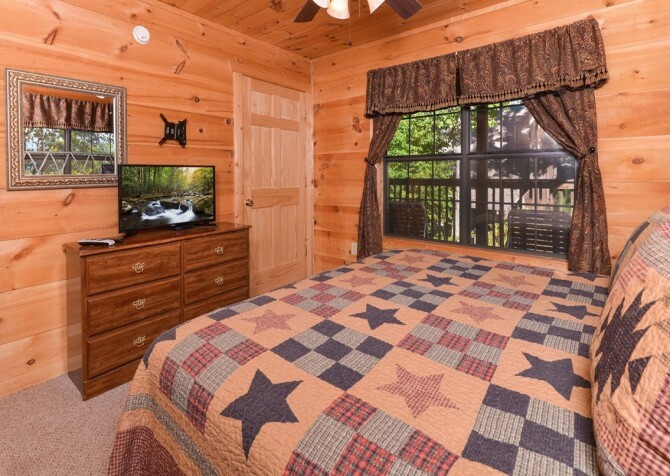 It will keep you up-to-date with upcoming events, give you more information about area attractions, and give you travel tips and cabin recipe ideas. If you love cooking steaks and burgers, fire up the charcoal grill for a cookout on a nice day. 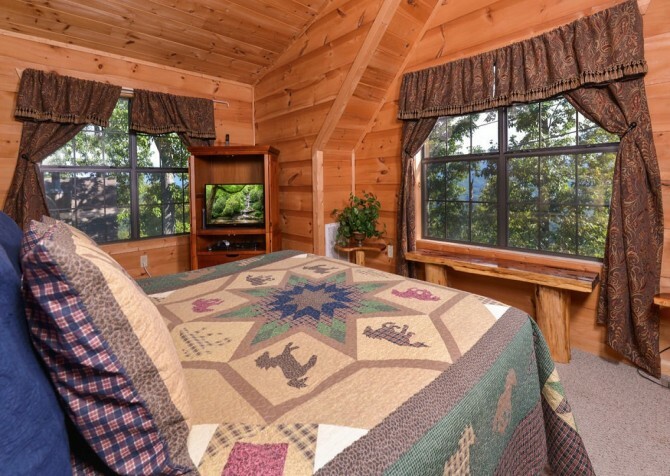 Explore the exciting mountain town of Pigeon Forge and find restaurants, outlet stores, unique shops, and attractions for couples and families. 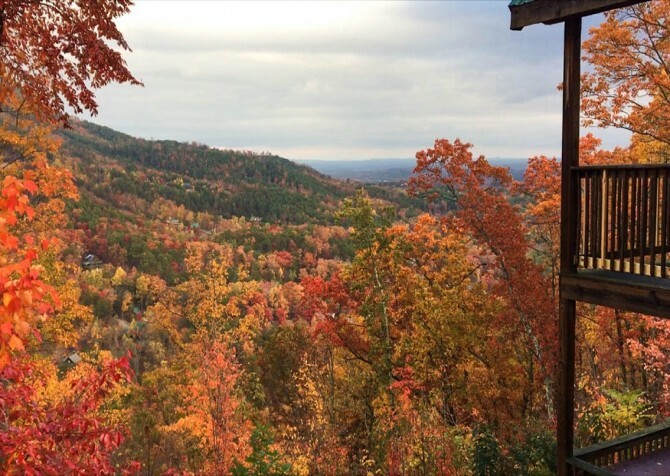 You'll find wineries, hands-on exhibits, and more. 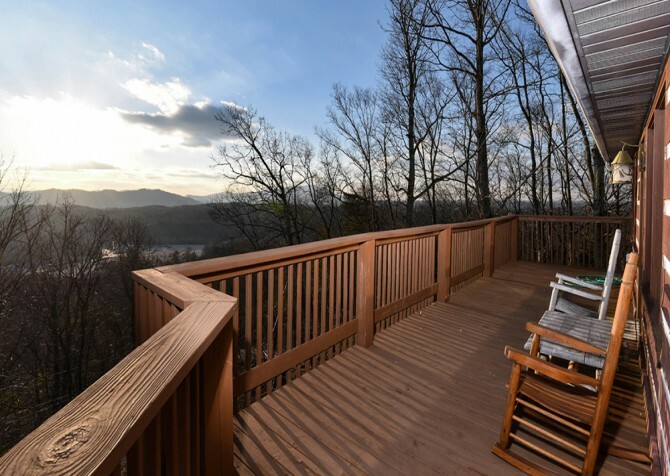 One of the newest attractions in Pigeon Forge, The Island is home to celebrity-owned restaurants, a show fountain, the Great Smoky Mountain Wheel, and lots of shops to check out. Watch amazing horse stunts, listen to toe-tapping music, and watch awesome light and sound effects as you chow down on a hearty meal at Dolly Parton's dinner show! 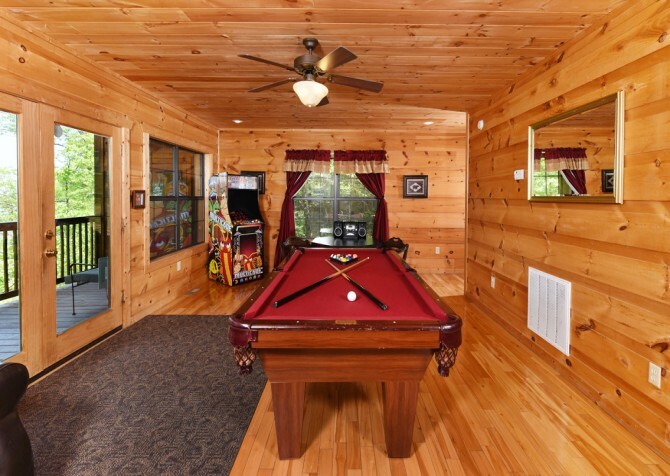 "I loved this home. 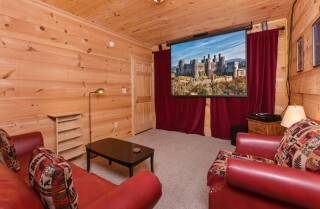 I expected it to be much smaller than it was. 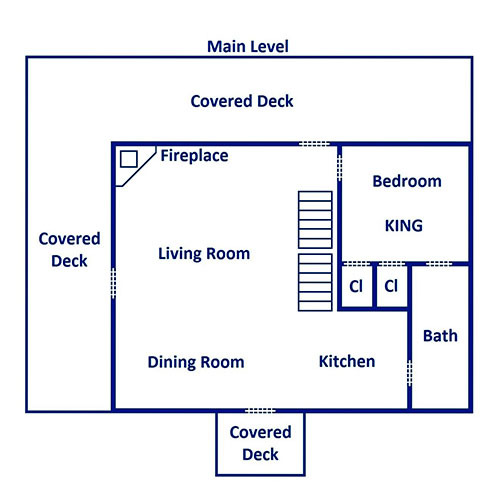 It was three levels with a master bedroom on the upper two levels. 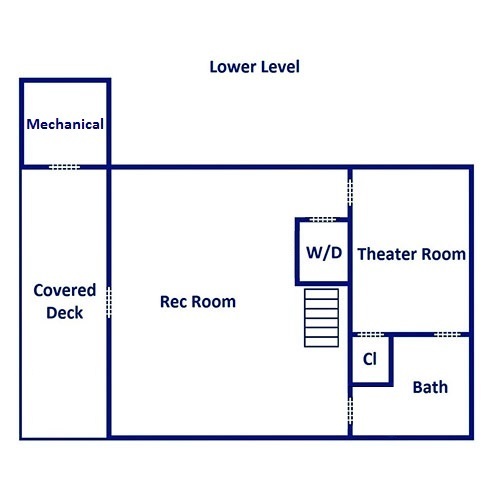 The first level had a game room and a theater room. 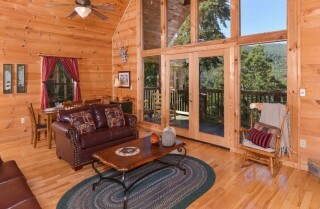 There was another living room on the middle level with the most amazing view. It was truly breathtaking. 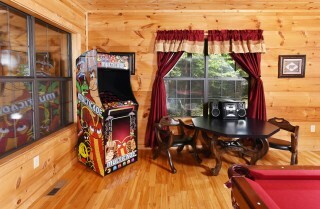 It had all of the amenities. I think I might have to go again someday."